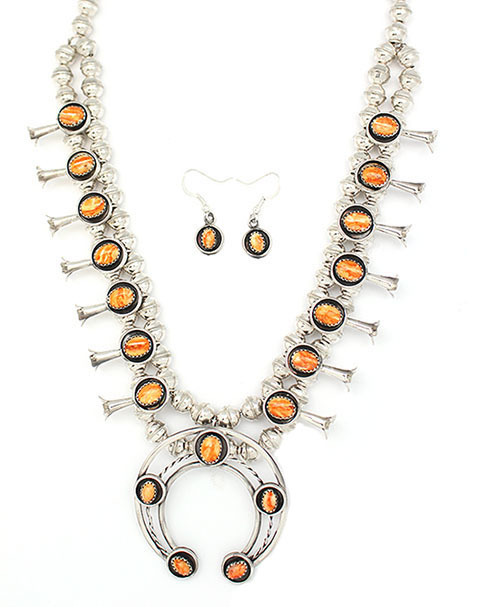 This sterling silver squash blossom set has a shadowbox look to it with 7 blossoms on each side and a 6x8mm orange spiney oyster stone in each blossom and measures approximately 18" long. Naja also has one 6x8 stones and measures about 1 3/4" long by 1 3/4" wide. Earrings measure approximately 1 1/4" long including silver plated french wire by 3/8" wide. 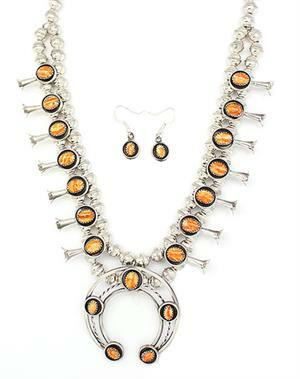 Strung on 8mm seamed beads and hand made by Navajo artisan Phil and Lenora Garcia. ***Now available in all red coral, all purple spiny oyster, all black onyx or tuquoise and coral alternating. *** Choose other color when ordering. None available in orange spiney as pictured at this time.